Call it what you like, The knife is a spittin' image of the old discontinued liner-lock sod buster first made by W.R. Case & Sons. And guess what? It is fantastic. Case has said repeatedly that they have no plans to re-release the pattern. Rough Rider has been making this pattern for some time and quite frankly, if you don't own one, what are you waiting for! 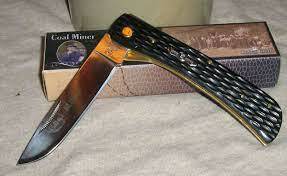 Anyone who collects Sodbusters or sodbuster like knives should jump on this pattern. I have two of these Rough Riders. The coal miner and tortoise shell. Both are excellent in every aspect. Sharp right out the box with a very positive, super strong liner lock, and just a beauty to cut with. They make an excellent work knife and are half the price of Case's cheapest non-locking sodbuster. Just a great work knife and perfect for the back pocket!